Several months ago, I posted this photo of the “license plate” I designed for the AMB/Clothworks Blog Tour. 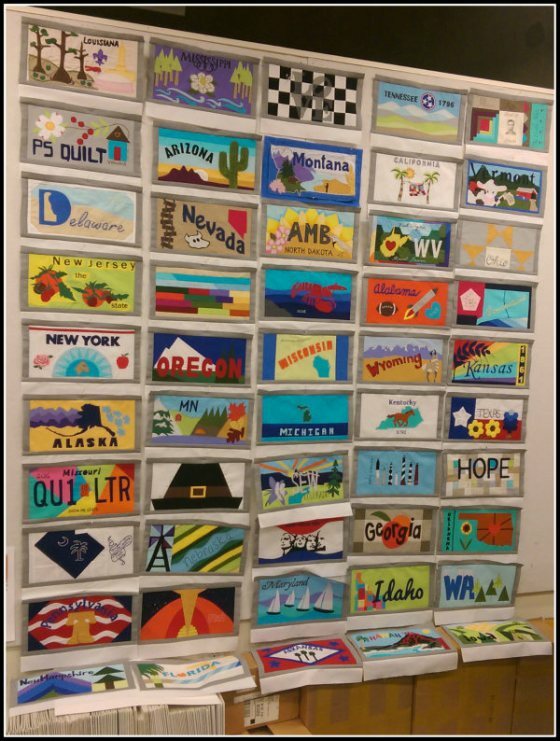 One blogger from each state was asked to design a license plate representing their state. 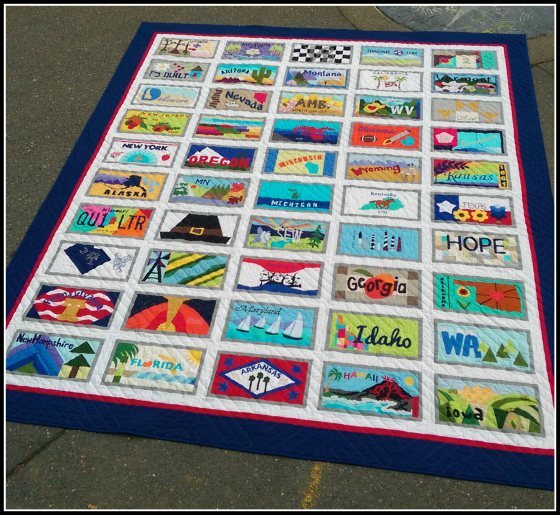 Those license plates have now been sewn into a quilt and I thought I would share the photos of the completed project. Toni, who works for Clothworks, was given the task of assembling these fun blocks. Putting together this much color and design had to be a challenge. She chose a grey border and white sashing around each block. Then she placed a small red border around the blocks, and finished it off with a wider blue outer border. Then it was sent off to the long-arm quilter for some straight line quilting, which is perfect for this quilt. 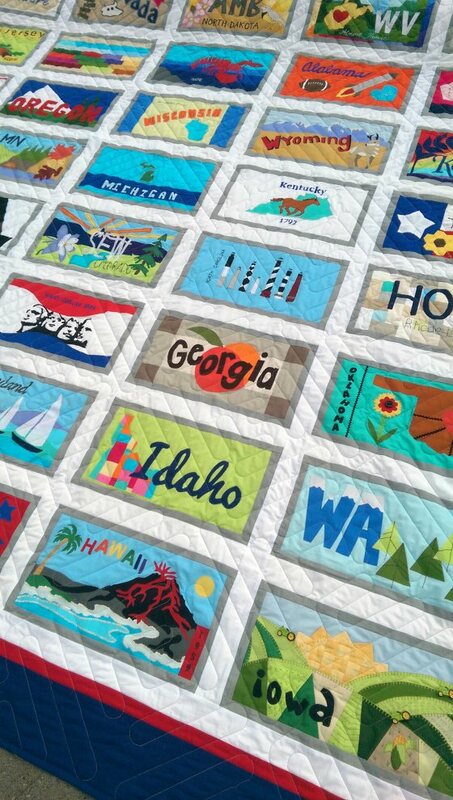 Manusco Show Management has picked up the quilt for display in their 2015 quilt show schedule, so the quilt will be traveling to California for Quiltfest in Palm Springs, and Pacific International Quilt Festival in Santa Clara in October. I am looking forward to seeing it in person at PIQF! I remember the blog hop featuring all these license plate blocks. It is great to see them all together in 1 quilt. 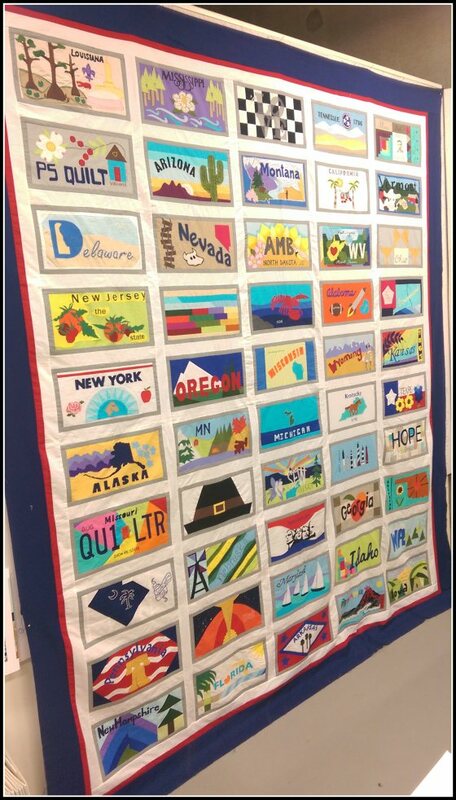 Thanks for sharing the photos of the quilt. It is truly a “fun” project. Kudos to the young lady who put it all together. Thanks for sharing the final product. I followed the tour online, and wondered what it would look like. Very nicely done! Just beautiful. I will be at PIQF too and look forward to seeing it in person!